Sphalerite should be a good host mineral for fluid inclusions and resist post-entrapment modifications. All of these sphalerite samples are from sedimentary syngenetic carbonate hosted deposits, formed at low temperature. The much older Woodcutters deposit has been remobilized during folding and is cut by later quartz veins. The woodcutters sphalerite (red curve) shows a peak at 200 C which may be due to CO2 rich fluid inclusions, perhaps related to this later fluid event. Note that the decrepitation for samples 1104B and 1113B is quite intense and the results have been divided by 3 to fit this plot scale. Sample 1113B (cyan curve), from Fedjal Joum, was a mixture of baryte and sphalerite and this graph is probably dominated by the baryte decrepiutation. The intense peak at 630 C on sample 1104B from Bou Grine is unusual and cannot be attributed to baryte contamination, which would cause a peak at much lower temperature. The high temperatures of sphalerite decrepitation of 350 - 400 C are inconsistent with the low temperature sedimentary origin of these deposits. 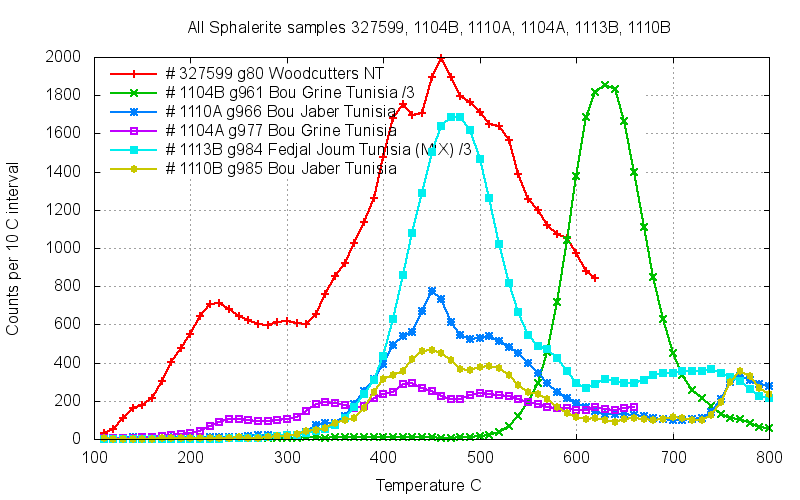 Sphalerite samples can be used for comparison but not for formation temperature estimates without further research.